This item is expected to ship 4-6 weeks after the event on July 23, 2019. This certificate program recording is vital for anyone who works with dementia patients and needs skills and proven strategies to provide optimal care! Dr. Sherrie All provides you with the assessment tools and interventions you need to identify and differentiate between dementias, prevent and reduce difficult behaviors, and improve your ability to communicate with cognitively impaired patients! More than just an overview of dementia and Alzheimer’s, this program will offer practical solutions to some of the most challenging real-life situations you face and bring you up to speed on the latest medications, preventative treatments, and advances in early detection that could impact your work. 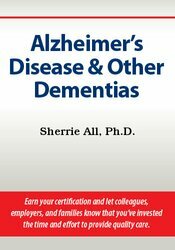 Best of all, you’ll get your Certificate in Alzheimer’s Disease & Other Dementias letting colleagues, employers, and families know that you’ve invested the extra time and effort necessary to understand the complexities of the disease, build essential skills, and employ safe and effective best practices to provide quality care. No matter your profession, you’ll leave this comprehensive recording more confident in your ability to minimize challenging behavioral issues associated with dementia, improve communication with your patients, and provide the best care possible for this vulnerable population! Communicate how the manifestations of each type of dementia impacts identification and prognosis. Provide a synopsis of 2 assessment tools that can be employed to screen for possible cognitive difficulty. Specify how non-verbal communication skills can help professionals identify meanings behind gestures when working with patients who have dementia. Characterize how patient safety can be enhanced with strategies to redirect wandering and manage paranoia. Establish how the latest medications, preventative treatments, and advances in early detection could impact care of people with dementia. Explore end of life issues and elder abuse and correlate how the ethics of dying impact the clinician, client, and their family. Sherrie All, PhD., is a Licensed Clinical Psychologist specializing in neuropsychology, cognitive rehabilitation and brain health. She owns and directs the Chicago Center for Cognitive Wellness (CCCW), a group neuropsychology practice offering assessment and treatment services in cognitive rehabilitation and psychotherapy to people affected by cognitive decline. As a leader in the field of brain health, Dr. All works to educate the public on brain-healthy behaviors and innovating brain health coaching. Her work in this area earned her the 2010 Sharpbrains Innovation Award for Most Innovative Mental Health Program as well as the attention of media outlets such as The New Yorker and Crain’s Chicago Business. Dr. All trains other professionals in how to implement cognitive rehabilitation interventions into their practice, through continuing education programs, supervision and individual consultations. She shares her detailed understanding of the brain and brain-behavior relationships in an engaging and relatable way. Dr. All’s forthcoming book and current keynote address, “Brain Destiny: Everyday Choices to Lower Your Risk for Dementia and Change Your Life”, offers an entertaining way of promoting a popular understanding of the scientific theory of cognitive reserve to empower people to effectively care for their brains. She has been an invited speaker by the Lifetime Education and Renewal Network (LEARN) of the American Society on Aging (ASA) and speaks regularly on the topics of brain health, cognitive rehabilitation and interventions for early-stage dementia. Dr. All’s research includes examination of functional MRI (fMRI) and electrophysiological (EEG) biomarkers of cognitive deficits. Financial: Sherrie All is the owner of the Chicago Center for Cognitive Wellness. She receives a speaking honorarium from PESI, Inc. Non-financial: Sherrie All has no relevant non-financial relationship to disclose.